Hostgator is a leading provider of shared, reseller, VPS, and dedicated hosting plans. 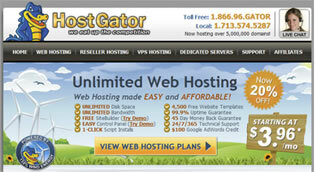 Founded in 2002, Hostgator has grown to house over 12,000 servers and manage over 400,000 customers. Their incredible growth is due in part to their innovative products and services which are always evolving to include the best technology available. Hostgator provides a wide variety of hosting packages to try and suit the needs of every customer. They have hosting packages that can support anywhere from personal static pages to fortune 500 company websites. Customers will be hard pressed to find a hosting plan that will not fit their individual needs. Hostgator offers 24/7 support via toll free phone, live chat, and e-mail ticket system. The support center on their website is packed full of other useful features, such as a search function, a helpful resources section, and user forums where all the most common support issues are discussed. Wait times are a bit longer than desired due to the large client base, but issues are resolved quickly. One of the ways Hostgator entices customers is with their top tier technology. They are constantly updating their software and upgrading their hardware to be sure their customers are getting the most out of their hosting accounts. Whether it is a small personal blog or a large business site, all customers enjoy the best technology available with Hostgator. Hostgator offers the industry best cPanel control panel. With it’s snappy response and library of features it is by far and away the best control panel on the market today. No other hosting control panel can match what cPanel has to offer in the way of ease of use or responsiveness.